Billy White Wolf vs Harry Fujiwara-- 1 fall-- 20 minutes. Result: White Wolf won on a disqualification when Fujiwara used karate. Nick Kozak vs Dutch Schultz(Savage)-- 1 fall-- 20 minutes. Result: Kozak and Schultz battled to a draw. Ripper Collins vs Eric Frolich-- 2/3 falls 45 minute TV time limit. Result: Collins defeated Frolich. Collins used an Atomic Drop to take the first fall. Erich Frolich evened the match with a drop kick and a body press. Frolich counted out of the ring for the 3rd fall. Jim Hady signs autographs before the match. 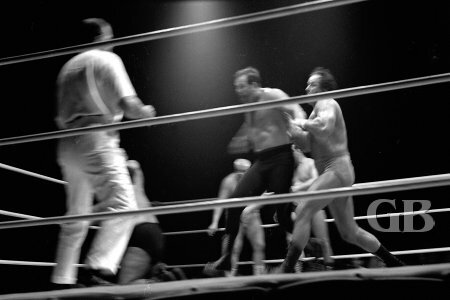 Jim Hady about to land a haymaker on Curtis Iaukea. Johnny Barend, Jim Hady, & Lord Blears vs Ripper Collins, Curtis Iaukea, and Dutch Schultz. 2/3 falls to a 1 hour time limit. Result: Collins' team won. 1st fall- Collins applied an Atomic Drop on Barend to take the first fall. 2nd fall- Barend evened the match with punches and a body press on Collins. 3rd fall- Lord Blears was counted out of the ring while he was choking Ripper Collins. Blears should have been in the ring with Schultz. 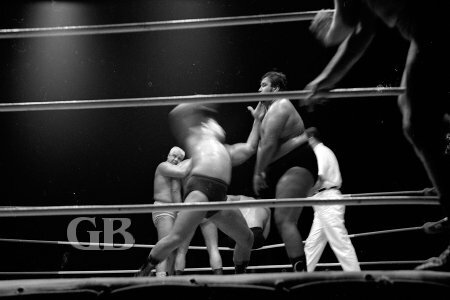 Lord Blears and Jim Hady trap Ripper Collins and Curtis Iaukea in the corner. 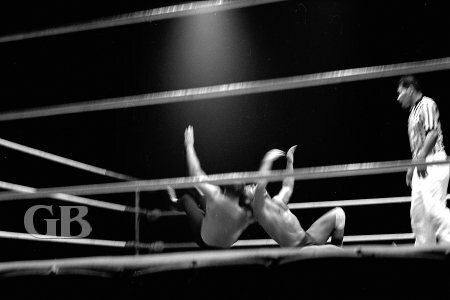 Johnny Barend throws Dutch Schultz into the corner turnbuckle. Women's U.S. Champion Kathy Starr. Kathy Starr attempts a Boston Crab onto Jessica Rogers. Main event: Women's United States Championship. 2/3 falls to a 1 hour 1 minute time limit. Champion: Miss Kathy Starr Challenger: Miss Jessica Rogers Result: Miss Kathy Starr defeated Miss Jessica Rogers to retain the United States belt. 1st fall- Rogers took the first fall with a body press. 2nd fall- Starr used a reverse cradle to even the match. 3rd fall- Starr used a body press after Rogers missed a flying tackle and hit the corner turnbuckle. Jessica Rogers and Kathy Starr try to pin each other while entangled. 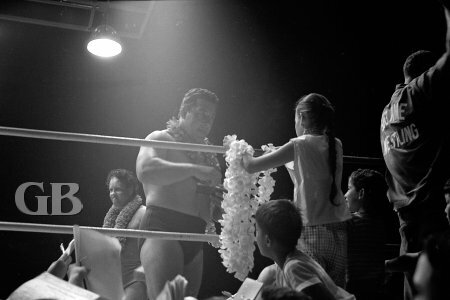 Wrestling Notes: Lord “Tallyho” Blears indicated that Wild Bill Dromo will be returning to Hawaii. Making his debut in Hawaii in the very near future will be Tank Morgan. I guess the fans on the East Coast are familiar with Morgan. Next card will be at the Honolulu Civic Auditorium on August 16, 1967. Here is the card: In the first match of the evening, Ripper Collins will take on Beauregarde. Curtis Iaukea will take on Kongozan in the special event. Miss Kathy Starr and Eric Frolich will take on the team of Miss Jessica Rogers and Dutch Schultz in a mix match. The main event will feature a Hawaiian Tag Team Championship match. Johnny Barend and Jim Hady will defend their title against Chief Billy White Wolf and Nick Kozak. Chief Billy White Wolf will leave for Japan on August 25, 1967.